Mike did a interview with NYS Music in regards to his show at The Madison Theater. Click Here for the direct link. Albany area-based guitarist Mike Campese has an incredible resume built off of a talent he has perfected from an early age. Guitar was his academic pursuit, one that has served him well and opened doors both in opportunity and experience. Of the several big acts he has opened for or worked with, the most familiar of the Christmas season is Trans Siberian Orchestra whom he recorded and toured with for a short time. 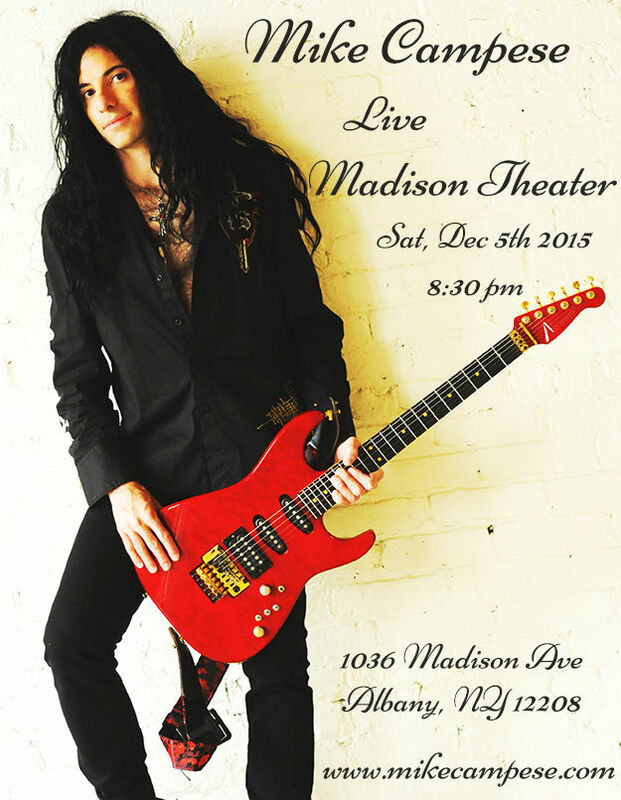 This Saturday, Dec. 5, Campese is performing at The Madison Theater in Albany at 8:30 pm. With a lot to talk about, Campese chatted with NYSMusic about some of his influences and experiences and about what’s in store for this Saturday’s show. Steve Malinski: How did you get started on the professional musician track? Mike Campese: My brother played acoustic guitar and my dad had been a violinist but went into engineering. My early influences were Black Sabbath and the guitar-driven bands. It went from there. I took lessons as a kid and would hang out at the music store at the mall, see all the guitars hanging up. I’d always ask the guy what the price is and they’d be so expensive. He didn’t think I’d buy it but my mom came up to the mall and helped me out. My sister and her boyfriend had gotten me a bass but I didn’t want to play bass so I traded it in the next day. But yeah, I was really into Black Sabbath and they influenced me as a kid. I moved to Los Angeles for the Guitar Institute (GIT) at the Musicians Institute (MI). It was a great experience, great school. I was exposed to all kinds of music. My teacher was a jazz guitar player. Before I went there I had already known a lot of theory but it opened a lot of doors musically for me. SM: You mention Black Sabbath as an influence, so I see why you went for that guitar driven style. But you really have a playing style along the lines of Eric Johnson, Steve Vai, Buckethead, and so on. How’d you ultimately settle into that groove? MC: As you advance as a player… even though I love Black Sabbath, their stuff was easy. Catchy, but easy. I got more into – my brother was into Al Di Meola. I would listen to his stuff, and brought some of that to my teacher. Then Yngwie [Malmsteen] came around too. So they’re the ones who started it for me. I started listening to more of the classical stuff. My dad and I were driving in the car to school one day and I said “Why don’t you put on the rock station?” He replied with “Oh, like classical stuff?” I told him I didn’t want to listen to classical stuff but he said I should. So I started listening to Mozart, Beethoven, Vivaldi. The shred stuff – Paul Gilbert was teaching at GIT and I was in his classes. Eric Johnson – I first heard him play at MI. I remember hearing “Cliffs of Dover” and our teacher had shown us how to play the riffs. I love Steve Vai’s Passion and Warfare. I’m glad I grew up in the time that I did because nowadays there are so many different genres to sort through. But yeah, I’ve always been a fast guitar player after my first year of playing. And now I’m better at composing and am more well-rounded than I was as a teenager. It does take a lot of maintenance playing every day – really have to keep up with it. SM: Can you talk about your experience working with Trans Siberian Orchestra? MC: I was part of the band in 2004/2005, around the time when Lost Christmas Eve was out. I got a call from them and auditioned. Paul O’Neill – I was down in the city and auditioned and they were really happy when I played. About a week later I got a call from their manager and he said they’d like to hire me for the band. It was really cool. I wasn’t in the band for a really long time, just a couple of years, and I hope to get back to them again sometime. It was a great experience traveling and playing the music, covering both the left and right guitar parts. It was really amazing experience, incredible band. Just being picked for that, I was amazed. It was a great accomplishment – a band like that, multi-platinum band. I still talk to them. We’re on good terms and I see the guys in the band all the time. A lot of guys in the band have their own groups so I support their bands. I play a trade show in California every year and always run into them there. So at some point – you never know with these bands – there are so many musicians they work with. There’s a full east coast and west coast touring band. So we’ll see. After that I put out a Christmas album of my own, The Meaning of Christmas. It’s similar to Trans Siberian Orchestra but its more guitar driven and there’s some acoustic and vocal work on it. So it was right after and I thought that maybe I should do my own Christmas stuff. So I’ve been promoting that recently since it’s Christmas season and it’s really the only chance I get the chance to do that. I like Christmas music but did change it up and wrote new sections of the pieces and did a few of my own original Christmas tunes. So it wasn’t like the same traditional tune but a re-written version to basically get it out of my system. SM: Aside from Trans Siberian Orchestra, you’ve gotten to play with or open for some pretty big names? MC: Yeah! My own band, my original band played. It was Mötley Crüe, Godsmack, Drowning Pool… That was an awesome show, a great experience playing at SPAC. The cool thing is that my stuff is different that all those guys. My stuff was exposed to people who don’t normally dig into that type of sound. I try to play music for the crowds. I have acoustic material too, so I mix it up at my shows. And this Saturday I’m going to be doing a little acoustic segment in the middle of the show. It’s going to be mostly an electric show though, with that in the middle. We’ll be playing a variety of stuff, things off the Christmas album and the others as well. So I’m looking forward to that. At the Madison Theater, being a movie theater, they’ve got a screen behind us. I was there recently and asked the sound guy and he said we could use the screen if we want. Se we’ve got some videos and backdrops that we’ll have behind us. I’m looking forward to it because people are coming to see us whereas at a bar people are just hanging out and we’d be more of just a background sound.